Ginger has been used as a culinary and medicinal spice since the days of early India, China and Japan, and was a staple in the kitchens of Ancient Greece and Rome. Believed by medieval Europeans to have occurred in the Garden of Eden, it is used to treat a range of ailments, from nausea, motion sickness and heartburn to arthritic pain and migraine. The rhizome or root, which grows underground. It is available in fresh, dried, capsule, tea, tablet or crystallised, candied forms. Ginger’s active ingredients include pungent phenol compounds called gingerols and shogaols, and a selection of volatile oils. Tests show that ground ginger also contains useful amounts of manganese, which builds energy and strong bones. Relieves nausea caused by pregnancy, chemotherapy, food-related issues and migraine. Eases motion sickness and vomiting. Unlike anti-nausea drugs, which work primarily on the central nervous system, ginger acts in the digestive tract. Its spasmolytic action relieves irritable bowel syndrome and flatulence. An appetite and digestive stimulant, ginger enhances enzyme activity and gastric motility. Anti-inflammatory action eases pain and swelling. Gingerols, like aspirin, inhibit certain blood-clotting factors and may help prevent cardiovascular disease. Japanese studies show that both gingerols and shogaols stimulate the body’s production of adrenaline. Ginger appears to block the effects of prostaglandins, substances that may cause inflammation of the blood vessels in the brain, leading to migraine. High doses of ginger may interact with warfarin, diabetes or heart medication and drugs to reduce blood pressure. May cause heartburn, gastric irritation or bloating. Consult your medical practitioner before taking herbal remedies. Ginger is a star in many recipes, adding spice to ginger ale and gingerbread and a distinctive kick to Indian and Oriental cuisine. Buy smooth and firm ‘hands’ of ginger with glossy (not shrivelled) skin. Peel and grate, slice, chop or mince as required. Any that remains can be kept in the freezer. Ground ginger is a spice-rack staple. It grows well in warm, moist frost-free regions and should be kept well-watered in drier areas. Not suited to the Highveld or where conditions are extremely dry. Plant at any time of year in fertile, well-composted soil in a sheltered, sunny position. Keep moist. Water well once the stalks appear. The rhizomes can be harvested 9–10 months after planting. Serve this as palate cleanser between courses or a fresh, lively summer dessert. Combine 2 cups sugar, 2 tablespoons peeled, minced ginger, 2 teaspoons freshly grated lemon zest and 4 cups water in a heavy-bottomed saucepan. Bring to a rolling boil, stirring often. Boil, uncovered, over medium heat for 10 minutes. Cool. Stir in 1/3 cup lemon juice. 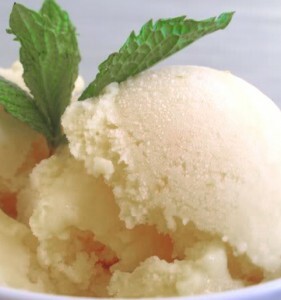 Freeze the mixture in an ice-cream maker, according to manufacturer’s directions. Break into pieces and blitz in a food processor until smooth. Transfer to a chilled airtight container and return to the freezer for 30 minutes to 1 hour, or until firm.